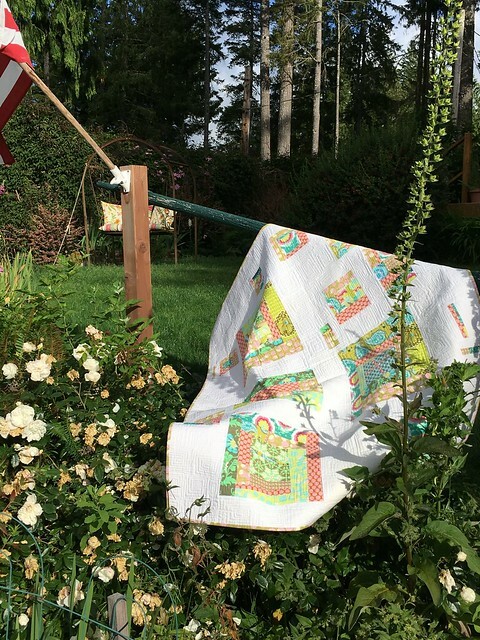 Sister Quilts | What Goes With What? 2 quilts using some of the same fabrics and color scheme. The first Sister came about while I was still working at Pink Chalk Fabrics. 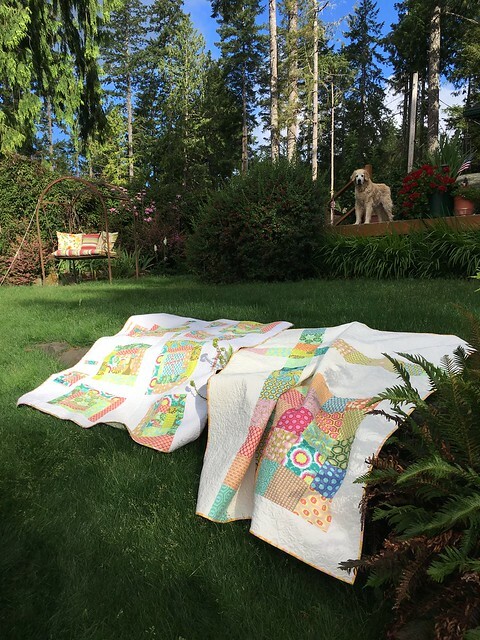 It started with a charm pack from Amy Butler at the Portland Quilt Market in 2013. The Chalkettes visited the Colette studio where we met Sarai along with Amy and David Butler. I was a bit star struck. Once the front was completed I thought I’d make my back more scrappy. I started playing with improve log cabins. Guess I got carried away. Pretty soon I had enough for another quilt. 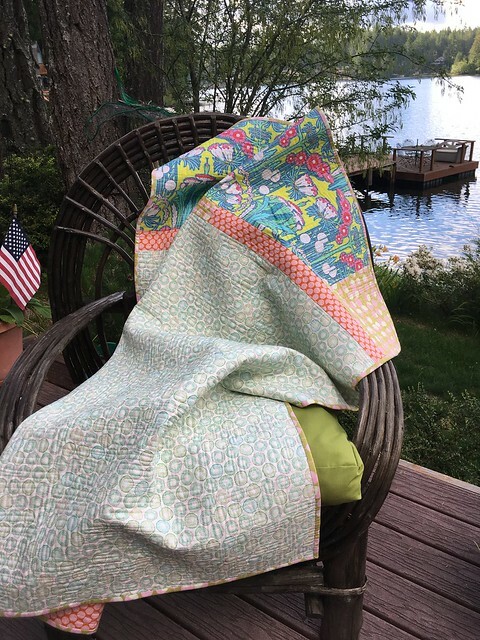 So the back became a front and the Sister Quilts were born. 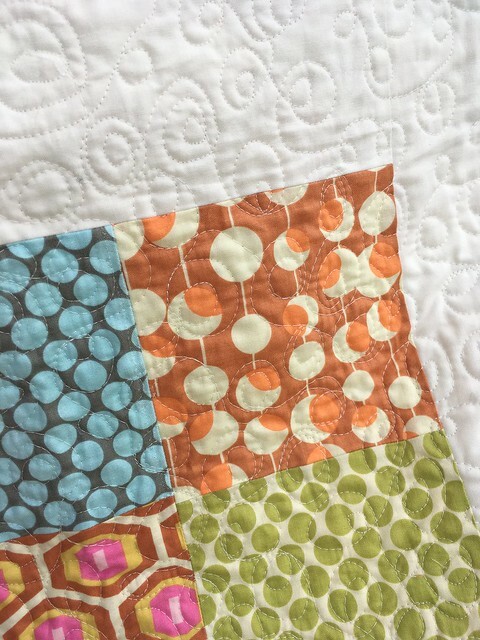 The quilting on Sister 1 mirrors the circles in most of the Amy Butler fabics. I love the Martini’s from the classic Amy Butler Midwest Modern. In fact the circles look much like the Martini’s. I tried a new quilt design on Sister 2 the log cabin. My thought was to mirror the square blocks. I’m quite pleased with how it came out. All of the quilting is done on my home machine. 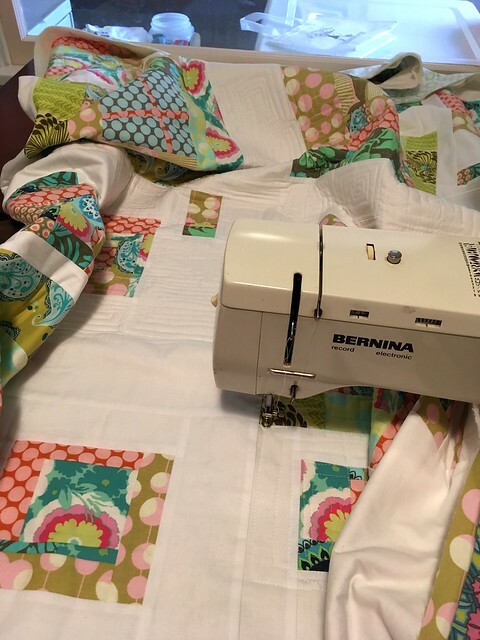 These days that’s the Bernina 830 Record that I found at a garage sale for $10. When I bought the machine it only had forward and reverse. A quick service fixed that right up. I have since replaced the brushes in the motor. I love the free motion on this machine. Here are a few pictures of the backs. And one more to finish off. 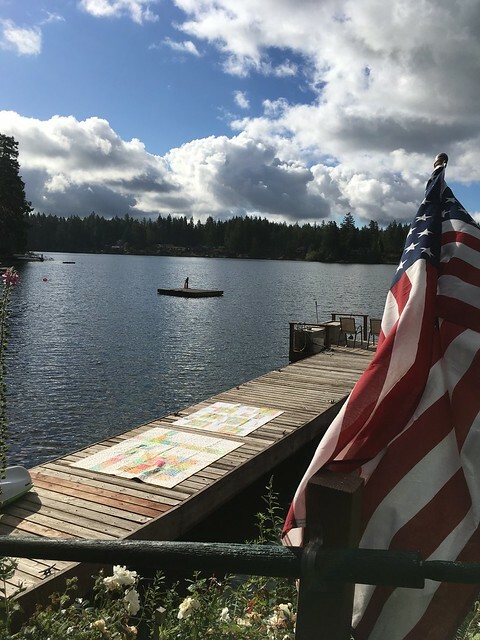 I was staying at my folks log cabin by the lake watching their dog Brody. The perfect setting. 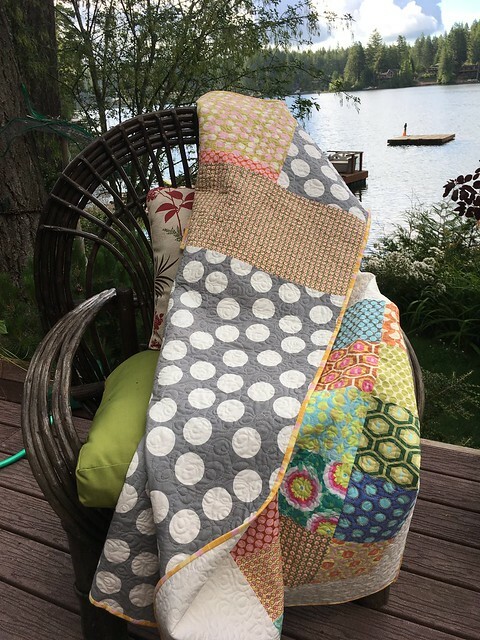 This entry was posted in Sewing and tagged Amy Butler, improve quilt, Log cabin, modern quilt, quilting by Diana. Bookmark the permalink. I love them both, Diana! 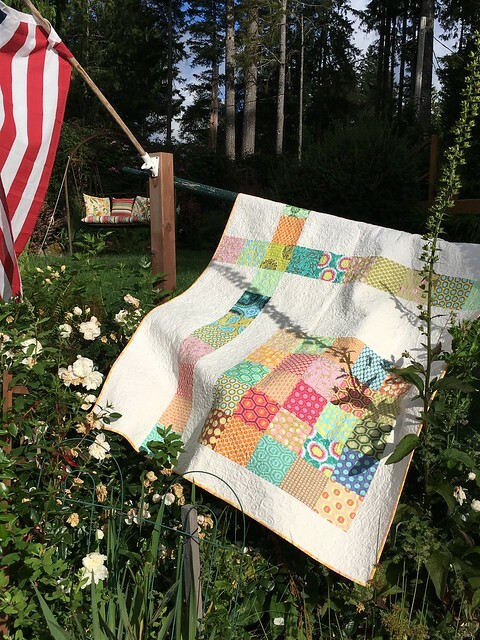 Your quilting choices fit each quilt perfectly. 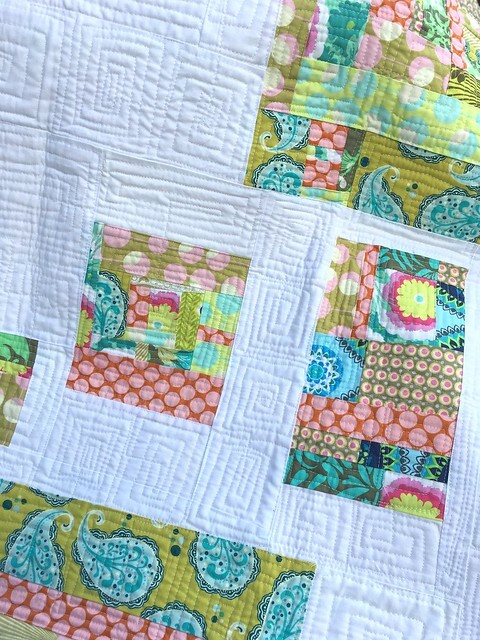 Thank you @pennylanequilts I really enjoyed quilting both of them.